Posted By:Unknown | At:8:58 AM Be the first to comment! How did I know they were going to go the Clarence Thomas route with their defense of Uncle Herman. Even Stevie Wonder could have seen this one coming. 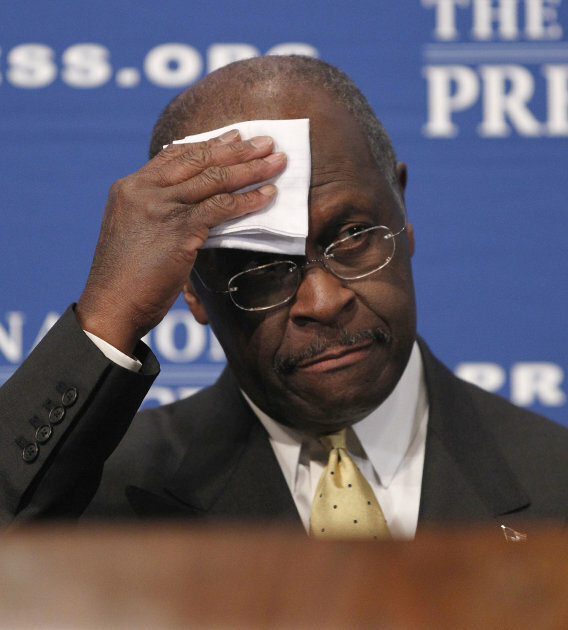 ATLANTA (AP) — Conservatives rallied around Herman Cain as he battles sexual harrassment allegations, likening the attacks on the Republican presidential contender to what they describe as the "high-tech lynching" of another prominent black Republican: Supreme Court Justice Clarence Thomas. The forceful early reaction to the Cain firestorm — fueled by racially charged rhetoric — suggests the Georgia businessman's attempt to cast himself as a victim of the media and liberals is, so far, paying dividends among his conservative Republican base, who will hold considerable sway in selecting the party's nominee. But the accusations against Cain, an untested newcomer on the political scene, may give more moderate GOP voters pause and could cause would-be donors to shy away even as Cain works to capitalize on his rising poll numbers. With the first-in-the-nation Iowa caucus less than three months away, the harassment allegations — and Cain's response to them — have the potential to reshuffle the GOP race. So far, the early cry from the right is to support Cain using a race-based defense and familiar targets. Becoming a target of the left and the media could bolster Cain's support among those who view those groups with disdain. "I think the left is totally and completely terrified of a conservative black man coming to power and prominence," said Debbie Dooley, a leader of Atlanta Tea Party Patriots. "They are trying to do the same thing to him that they did with Clarence Thomas." It was view that echoed loudly across talk radio and the Internet as conservative pundits weighed in. "It's outrageous the way liberals treat a black conservative," fumed pundit Ann Coulter. Radio show host Rush Limbaugh lashed out at the mainstream media for pursuing "the ugliest racial stereotypes they can to attack a black conservative." "This is about blacks and Hispanics getting uppity," Limbaugh continued. "(Liberals) cannot have a black Republican running for office, can't have a Hispanic, the Left owns those minorities, those two groups can't be seen rising on their own." The head of the conservative Media Research Center, Brent Bozell, labeled the story a "high-tech lynching," evoking Thomas' divisive Supreme Court confirmation hearings two decades ago, where he was confronted with sexual harassment allegations from a onetime employee, Anita Hill. The allegations against Cain came to light Sunday night. Politico reported that at least two women who complained about sexually inappropriate behavior while working for Cain at the National Restaurant Association had signed agreements with the restaurant group that gave them five-figure financial payouts to leave the association and barred them from discussing their departures. Neither woman was identified. The report was based on anonymous sources and, in one case, what the publication said was a review of documentation that described the allegations and the resolution. Politico said Cain spokesman J.D. Gordon told their publication that Cain himself had indicated to campaign officials that he was "vaguely familiar" with the charges and that the restaurant association's general counsel had resolved the matter. On Monday, Cain — who completed a round of Washington appearances amid a frenzy of media attention — labeled the charges a witch hunt. He said he was aware of the allegations made against him in the 1990s but called them "baseless" and denied he sexually harassed anyone. He said he had no knowledge of whether the association provided any such settlements, and he declined to address specifics of the accusations or the resolution. While Cain seemed to benefit from an early burst of support in key quarters, the full impact of the charges is not yet known. Women's rights groups expressed frustration that, 20 years after the Thomas hearings, sexual harassment complaints had again been reduced to a partisan fight. Erin Matson, a vice president for the National Organization for Women, said the women in question should be given the benefit of the doubt. "It is deeply insulting that this is being called political," Matson said. "Sexual harassment allegations are always about a woman who is simply trying to go to work." Still, for some the desire to oust Obama could trump most anything else.